Cross necklaces for women come in a variety of different styles, finishes and sizes at HolyLand-Gifts.com. That is why a woman should easily be able to find an impeccable necklace that suits her religious needs in a perfect manner. You can use these necklaces as perfect gifts for sharing with members of Christian groups, give them as gifts to your friends on their birthday or use them as a connection to give your religious beliefs more attention and dimension. 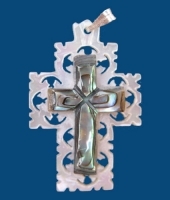 Our crosses are hand-crafted by skilled and highly professional Bethlehem Christian artisans. Give new heights to the way you support and respect your Christianity with cross necklaces made of olive wood that make a woman look more beautiful and take her closer to Christ. So, browse our website and find a perfect cross necklace that is made only for you and add more beauty to your personality when you wear it around your neck. We got great one of a cross necklace at whole sale price…can’t beat the deal we recieved.